What is Inner Humanism - How does it Address Unhappiness & Unlock Happiness? how does it address unhappiness & unlock happiness? WHY IS IT HARD TO CHANGE YOUR PAINFUL FEELINGS, NEGATIVE RELATIONSHIP PATTERNS & UNWANTED BEHAVIORS? When you struggle with unhappiness in the form of unwanted feelings, behaviors, or negative relationship patterns, it is not unusual to become discouraged and convinced, at some level, that you just have to live with your problems. Such a disheartening belief is often a response to not being able to change these problems in a satisfactory way. Viewing unhappiness as something you have to live with might also unknowingly reflect a broader cultural view that disseminated from preceding psychological theories. Many common forms of unhappiness were assumed by popular theories to be undesirable yet inevitable aspects of human nature. 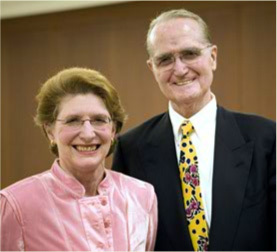 Martha Heineman Pieper, Ph.D. and William J. Pieper, M.D. undertook to critically examine these assumed limitations in human happiness. They questioned whether there could be other explanations for painful feelings, unwanted behaviors, and relationship problems that people so commonly experience, and for the difficulty so many encounter in achieving lasting change. Over the course of almost two decades of naturalistic clinical inquiry and theory development, the Piepers ultimately rejected many prior assumptions passed down over generations. They concluded that a view of human nature marked by inevitable unhappiness is both overly pessimistic and unsubstantiated. Their investigations led to an empirically-based view of human nature that is optimistic, yet realistic, in which many forms of inner unhappiness are believed to be preventable and treatable under optimal developmental conditions. GENUINE INNER HAPPINESS IS ATTAINABLE: The groundbreaking conclusion the Piepers reached is that it is possible for humans to develop a reliable inner happiness that is comprised of a certainty of being a lovable and loving person. This inner happiness, in turn, will serve as an individual’s inner foundation for developing the abilities to create loving relationships and to make constructive self-caretaking choices that promote happy lives. This primary inner happiness develops through a caregiving relationship when these essential needs are met in an optimal way. PEOPLE UNKNOWLINGLY ACQUIRE TENDENCIES TO CAUSE THEMSELVES UNHAPPINESS: The Piepers found that people are not born disliking themselves or others. Negative temperaments, feelings of alienation, and self-sabotaging behaviors are not part of our true nature. Rather, people acquire unhappy feelings toward themselves and others when specific needs that promote inner happiness – not previously identified – have not been accurately understood or adequately met. More specifically, the Piepers determined that out of unconditional love for their caregivers children copy the ways they are cared for. Indeed, children learn to care for themselves in the same ways they are cared for, both when the care they receive is accurate and optimal in meeting their developmental needs, and when it is not. Children develop tendencies to recreate unhappy feelings about themselves and others when these newly identified developmental needs that promote primary inner happiness are not adequately met, in spite of parents’ best intentions. The tendencies many children acquire to unknowingly recreate unhappiness continue throughout their lives, taking on many inner and outward forms, such as: chronic negative self-critical feelings, low self-esteem, lack of confidence, persistent moodiness, counterproductive relationship patterns (e.g., abusive behavior, or fear of commitment), long-standing bad habits, as well as counterproductive responses to stress and loss (e.g. fighting, or soothing feelings with overeating). In understanding that much of human unhappiness is not inevitable, and in identifying an optimal developmental process for meeting primary needs for happiness, the Piepers offer the possibility for us to begin to achieve greater happiness in our lives and to help our children become happier, as well. Parents are better equipped to fulfill their heart’s desire when aided with science through a more complete understanding of children’s developmental needs. UNDERSTANDING OBSTACLES TO LASTING CHANGE: As you know, even when you want to change some aspect of your life, you can't always stop doing something you know isn’t good for you (e.g., drinking too much, overspending, or choosing unavailable partners), or start doing something you know would be good (e.g., being more confident, being more available to your family, or exercising regularly). The Piepers came to understand the reason people experience difficulty in making and sustaining positive change, both on their own and within psychotherapy. These internalized tendencies to unknowingly recreate unhappiness respond to people’s efforts to leave this unhappiness behind by intensifying and reasserting their painful, destructive influence. In this way, psychological change is a process characterized by two steps forward and one step backward. They applied this understanding to develop a way of helping people avoid an all too common problem of seeing temporary setbacks permanently derail positive change (e.g., relapses in weight loss and quitting smoking). They went an additional step and created a way to help people turn these inevitable setbacks into opportunities for further growth. Martha Heineman Pieper, Ph.D. and William J. Pieper, M.D. giving a talk in 2006 sponsored by The Intrapyschic Humanism Society. INNER HUMANISM: Inner Humanism was developed by the Piepers to help people who seek to overcome their inner unhappiness through a psychotherapeutic relationship. They call their approach, Inner Humanism (abbreviated, IH), because the overriding focus is on the development of pleasurable inner happiness that is relationship based. This comprehensive approach to psychotherapy treats the acquired tendencies for recreating unhappiness, and addresses setbacks and the obstacles that interfere with lasting change. The treatment approach simultaneously focuses on strengthening an individual’s real, self-caretaking feelings, motivations, and behaviors through therapeutic caregiving that meets these needs in a natural developmental process. Inner Humanism Psychotherapists apply these advances in an individualized manner to help clients identify the tendencies for unhappiness that underlie their particular difficulties, and to understand why these tendencies developed and what function they continue to serve. Inner Humanism Psychotherapists seek to help each person overcome these tendencies for unhappiness, gain more control over feeling happier, and make more reliable, self-caretaking and constructive choices. For more information, see Inner Humanism Advances. You can learn more about the background story of who developed this psychotherapy approach, a great Chicago story, by clicking on the link, What is Inner Humanism? and visiting the page who developed it and why?